We’d love your help. Let us know what’s wrong with this preview of Children of the Nameless by Brandon Sanderson. Since the day she was born, Tacenda has been both blessed and cursed. When her protective spell fails in the night and her Kessig village is attacked, she seeks revenge against whom she believes responsible: the demon-consorting Lord of the Manor. To ask other readers questions about Children of the Nameless, please sign up. Is this a Cosmere story? After 60 years, I will be sitting with my grandsons and I will tell them how one day I wrote a review for a Brandon Sanderson book and that it was the top review -even if for a short time-!! 🌟 I have been in the mood for a Sanderson story lately for an unknown r After 60 years, I will be sitting with my grandsons and I will tell them how one day I wrote a review for a Brandon Sanderson book and that it was the top review -even if for a short time-!! 🌟 I have been in the mood for a Sanderson story lately for an unknown reason! I didn’t want to continue the second Mistborn trilogy yet so I was going to discover his other works as Elantris and Warbreaker. When I saw this Gift from Brandon, I thought it was a sign, it was also the perfect time to read this. This is a short story so that was also a good thing because his other books are huge. 🌟 The first thing I touched upon starting this is unsurprisingly the World building which Brandon is a master of. I have never played Magic: The Gathering but you don’t need to before going into this. I believe there will be things that I missed but it was a good experience nonetheless. 🌟 The writing is good but I know this is not Sanderson at his best and I guess authors as him are better in writing longer stories because it shows their potential and intellectual potential. 🌟 The plot was very expected for me from the first few pages and I don’t know if this is due to reading many Sanderson books or if it was obvious, guess I will never know! 🌟 Summary: I don’t have much to say about this book, guess because of its short length. It had an OK writing, good pacing but was kind of expect able. This is definitely not a new favorite but it does not change the fact that Sanderson is still a fav author of mine! I ended up giving it 3 out of 5 stars! Brandon Sanderson wrote a free-download Magic the Gathering novella for the 25th birthday of the worldwide known fantasy trading cards game so, having played MtG lots of years ago, it seemed to me this early xmas present timing was just perfect to start reading something of this author. Loved the Sanderson's style, the storyline, the characters and the setting: Innistrad with its curses, werewolf-hunters and other red eyed creatures with too long claws prowling the woods, reminded me a lot Dungeons and Dragons' Ravenloft and the Man of the Manor Deckard Cain Davriel Cane (with his delicious set of black/blue mana-fueled Planeswalker's skills) and demonic Miss Highwater were a great couple of characters making me smile a lot. No need at all of knowing MtG to fully appreciate this tale, but being a novella some parts seemed rushed to me and characters in need of a few more fleshing. I AM SORRY BRANDON, MY FAVOURITE AUTHOR. I was so excited about this one. 1- I stopped reading it before Christmas and here I am after 3 weeks or so, trying to get into it again. I just can't. I don't remember everything and I don't care enough to keep going. 2- To be honest, Brandon's short stories are not as good as his main novels in my opinion so honestly, I am not into this book. OMG, free book!! I know nothing about Magic, but if Brando NDF at 56%. OMG, free book!! I know nothing about Magic, but if Brandon Sanderson writes a story, I am going to read it! Thank you very much Mr Sanderson for spinning us this little tale as a Christmas freebie. I really hope you plan to take these characters further especially as you have introduced some of the best demons ever, especially Miss Highwater. Davriel definitely deserves many more pages - I always love these laid back characters who have to be spurred into action. Davriel would always prefer to take a nap but when pushed he can take on any thing. This is a great novella - not anywhere near long enough o Thank you very much Mr Sanderson for spinning us this little tale as a Christmas freebie. I really hope you plan to take these characters further especially as you have introduced some of the best demons ever, especially Miss Highwater. This is a great novella - not anywhere near long enough of course but then even your longest books are never long enough. (you may have guessed I am a fan). I love it! Brandon Sanderson did it again. I found out about this book the day it came out, through the articles google recommends for me. Despite being 100+ pages, BS still wowed me. Great world building as usual, amazing characters and plot. The writing is so good, that even though its a novella of an ongoing series, reading only this without the previous book won't be a problem. Its like its own book. Another thing I love in this book is its abundant of dialogue, most of which are witty. “There are nice parts of hell?” the Man asked. Miss Highwater glanced over her shoulder. Davriel is such a great character, he reminds ne of Tehol Beddict from the Malazan series, especially his relationship with Miss Highwater. Tacenda is my second favourite character in this book, despite her curse, she was still brave enough to help her people. Even though what she knew about her foe is all bad. Actual rating is 3.50. You can view my full review of this here! ALSO, THIS IS MY FIRST PUBLISHED BOOK REVIEW IN MY BLOG SO DOUBLE YAY! "They were all so certain that secretly he was some kind of unnatural monster–rather than just a man, the most natural monster of them all." I’m at that point in my life where I’d gobble up any written work of art Sanderson publishes. Apparently, I tend to gravitate more with his novellas rather than his epic fantasies. (I haven’t read the Mistborn series yet Actual rating is 3.50. You can view my full review of this here! ALSO, THIS IS MY FIRST PUBLISHED BOOK REVIEW IN MY BLOG SO DOUBLE YAY! Children of the Nameless is Sanderson’s own tale set in Innistrad, one of the planes in the game Magic: The Gathering. And nope, you don’t need to play the game or to know any of the references in this novella to enjoy it. Like the complete Sanderson whore that I am, I automatically ignored all my current reads and prioritized this one. It's Brandon Sanderson's birthday today!!!!!! HAPPY BIRTHDAY TO OUR ALL-TIME FAVORITE LLAMA HAHAHHA. Which is why I finally decided to read this free Christmas gift he gave to us; albeit it was rather anticlimactic and probably one of my least favorite novella of his, I still fairly enjoyed this one. Full RTC this evening! Fun, intriguing quick read with a central mystery centered around the magic. I enjoyed the two main characters different perspectives and the humor that kept it light. Don’t you just love it when your favourite author writes surprise novellas!?!? Brandon Sanderson has gifted us with a novella set in the world of Magic: The Gathering and I was on it like white on rice. A set of twin sisters protect their village against all sorts of things that go bump in the night, by way of their magical gifts/curses. But then the day comes when an unknown evil attacks, and the sisters’ gifts/curses fail them. The likeliest culprit seems to be the Lord of the Manor, a demon-consorting mystery of a man. It is a fun, quick read and does not require any knowledge of Magic: The Gathering. 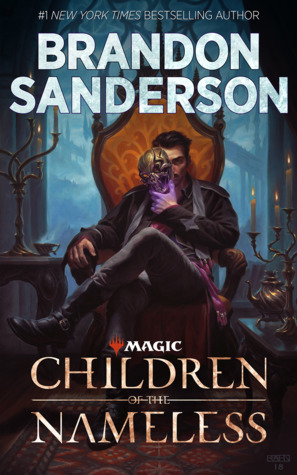 Sanderson fills this story with all the good stuff and does not skimp on characters , worldbuilding, humour or magic, regardless of the size constraint of the novella format. Despite everything it had going for it though, this has turned out to be my least favourite Sanderson story. I think my expectations were just a bit high, and had I tempered them or had I not known this was written by Brandon then I would have liked it much more. After all – my all time favourite novella is Brandon’s The Emperor’s Soul. Gothic horror infused fantasy, accessible to both readers familiar with the characters and planes (Avacyn and Innistrad feature respectively) of Magic the Gathering and those new to the table-top gaming lore. Introducing new characters (those not previously featured in Magic the Gather lore in card/other formats), Tacenda and Davriel gives author Brandon Sanderson an established but new playground to explore and expand upon and he does it in a captivating and entertaining way. Using the shorter l Gothic horror infused fantasy, accessible to both readers familiar with the characters and planes (Avacyn and Innistrad feature respectively) of Magic the Gathering and those new to the table-top gaming lore. Using the shorter length prose of a novella ensures each chapter progresses the story, be it character development, backstory, or pure action (of which there is plenty). A light, entertaining, and quick read. From what I've gathered on GR, I believe this novella is part of a series of books by different authors, set in the same world, based on a card game. However, I feel that this works well as a standalone read also. There are references to events that occur in some other books, but not too much is spoiled to prevent me from considering reading more in this series. What you're in for: chatty demons, pitchfork wielding villagers, magical singing, and strange cu A light, entertaining, and quick read. From what I've gathered on GR, I believe this novella is part of a series of books by different authors, set in the same world, based on a card game. However, I feel that this works well as a standalone read also. There are references to events that occur in some other books, but not too much is spoiled to prevent me from considering reading more in this series. What you're in for: chatty demons, pitchfork wielding villagers, magical singing, and strange curses. If you've enjoyed Sanderson's previous novellas such as Sixth of the Dusk and Shadows of Silence, this has a slightly similar feel to it and might be up your alley. Perfect. As a big fan of both Brandon Sanderson and MtG—and Innistrad being my favourite plane—I almost feel as if this book was written just for me. 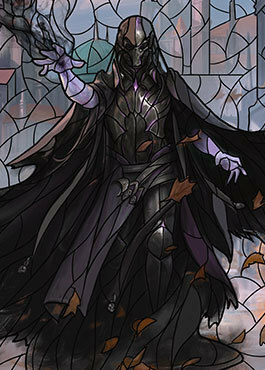 Davriel Cane has quickly become my favourite planeswalker. The day his card is released I intend on obtaining a complete playset as fast as possible! I predict he’ll be U/B and exiles the top card of the opponents deck to play for yourself, and possibly even the ability to steal abilities from other planeswalkers. And what of Tacenda? A G/W origins Perfect. As a big fan of both Brandon Sanderson and MtG—and Innistrad being my favourite plane—I almost feel as if this book was written just for me. Davriel Cane has quickly become my favourite planeswalker. The day his card is released I intend on obtaining a complete playset as fast as possible! I predict he’ll be U/B and exiles the top card of the opponents deck to play for yourself, and possibly even the ability to steal abilities from other planeswalkers. And what of Tacenda? A G/W origins style flip-planeswalker? Very excited. Alright, enough geeking out over predictions for printed cardboard; this is a review for a book, after all. I must admit, I didn’t really enjoy the first couple of chapters. They moved by quite fast—especially for a Sanderson story—however once Tacenda reached Davriel’s manor, I quickly fell in love with the story. The characters shined brightly and that Sanderson charm spilled over Innistrad. Tacenda is a twin to Willia, they are cursed with Blindness. Tacenda during the day, Willia at night. Along with their curse, they each have special powers. Tacenda can sing a special ward to protect the town. Willia has exceptional warrior strength. The bloke on the cover, Davriel, doesn’t perceive himself as all that powerful. His only magical ability is to steal spells from others, and his ability to planeswalk is the only thing that allows him to remain confident through conflict. He also has claimed an ‘entity’, which resides inside his head and wills him on to ‘use it’. The full extent of this entity is unknown—Possibly linked to the origin of Eldrazi or even something greater from the Multiverse?—however, he claimed it by killing someone, and is pursued by others because of it. One could assume those after him to be Nicol Bolas, his henchmen, or other planeswalkers. Remaining hidden from these pursuers is a big part of his motivation. This book should also receive the award for Most Charming Demons. I absolutely loved Crunchgnar and Miss Highwater. Basically, before the events of this book, there was a time where most demons—along with Avacyn—were imprisoned away in the ‘Helvault’. During the last visit to Innistrad, Lilliana Vess destroyed the Helvault, releasing the demons and Avacyn. Another planeswalker, Nahiri from Zendikar, also was released. She was mad at Sorin (Avacyn’s creator) for not protecting her home realm. Hence, she wanted to destroy Innistrad the same way Zendikar had been. She did this by pulling Emrakul (a giant Eldritch-like entity called an Eldrazi). Avacyn went mad by its near presence, Sorin killed Avacyn, and then the whole plane got all messed up by Emrakul infecting its soil. If you aren’t a MtG fan, go look at some artwork for the ‘Eldritch Moon’ set. Bit of a tangent there, but that explains why the angels went mad. Back to the demons, after being released, we can assume they were eager to ‘form contracts’ to consume souls. Davriel took advantage of this, promising his soul to several demons if they fulfilled contracts; contracts they would be unable to complete. This adds quite a bit of humour to the story, and I loved the way he and his demons bickered with each other. The plot focuses on a small Kessig town, called Verlasen, and how one day everyone, bar Tacenda, dies. She sets out to exact revenge upon Davriel. Tacenda's failed assassination inconveniences Davriel. But not as much as all his peasants disappearing. Or the fact he is out of dustwillow tea. Davriel sets out to find the answers to the problems, with Tacenda tagging along. Also, Davriel is hunting for hidden reserves of tea. Surely those peasants had some stashed somewhere? At first they assume the work of a necromancer had claimed the lives of Verlasen. Davriel knows the bog is far too powerful for a mere mortal to go up against. He wonders if it was the bog itself who claimed the souls. After all, most the townsfolk worship the bog and sacrifice their souls to it when they die. They believe it protects them from the horrors of Innistrad. And it has. Until everyone died. The Church of the Nameless Angel is his other suspect. They had been slowly converting the people of the town. But what would that force the bog to do? The story is full of mystery, action, and great interactions between humans and demons. Pacing is everything you’d expect from a Sanderson book. I absolutely loved it. Other than the start, if I was going to complain about anything else, it would be the length. I want more! I have a feeling it was due to the small length. Sanderson seems to write better when he has a larger scope. A fairly interesting novella, in true Sanderson style it’s nicely written and well paced. Davriel and his demons are interesting but the plot isn’t much to write home about. Probably since it’s a novella, it doesn’t have the depth, the compelling aura and those twists we usually expect from him. Overall, it’s a fair enough, quick read. Excellent. One of the candidates for the pleasant surprise of the year - went in with no expectations at all and ended up thorougly enjoying it. Full review to come. This Magic: The Gathering novella only in ebook edition was very enhancing. And great sources of magical abilities from these characters based on the card game. It came as quite a surprise for what he called his "secret project". In this MtG universe, even a story like this will have the big flip of surprise you didn't expect to think in the situation of the main plot. Tacenda Verlasin possesses the ability to sing a song that puts ease into the darkness, but for some reason, the song did not wor This Magic: The Gathering novella only in ebook edition was very enhancing. And great sources of magical abilities from these characters based on the card game. It came as quite a surprise for what he called his "secret project". In this MtG universe, even a story like this will have the big flip of surprise you didn't expect to think in the situation of the main plot. Tacenda Verlasin possesses the ability to sing a song that puts ease into the darkness, but for some reason, the song did not work as the Whisperers invaded and killed all sources of people in her village. Tacenda then seeks revenge on who is responsible and gets help from a surprising someone. I really enjoyed this! It’s a fun fantasy novella filled with magic, demons, and mystery. Like all Sanderson books, this features great world-building, an intriguing plot, and fantastic characters. This has some of the most likable demons you’ll ever encounter. And Davriel is just the best! His humorous dialogue with Miss Highwater was easily my favorite part. Note: I didn’t have any previous knowledge of Magic The Gathering, and still enjoyed it. As of yet, this has been the best magic story I've read. Sanderson really shows he's a good author. However, this story isn'ylt one of his best works I must say. The overal plot was compelling as were the characters (mostly at least). It reads slightly like it was a bit of a rushed job however. The characters are more cliché than the other novels I've read from him and the dialogue sontimes seems to be forced towards certain conclusion. Quick read with some enjoyable MTG easter eggs if you're even passingly familiar with the game. An excellent standalone epic fantasy novella with a ton of magic, action, and interesting characters. If you're a fan of Magic: the Gathering, that's just gravy on top--no knowledge of the game is necessary (no interest in playing it, either.) Very satisfying. This novella is free in his website, and I have to say Sanderson is awesome. It is a quick one hour read with an amusing story with interesting characters. I enjoyed reading it. The story is told from the viewpoint of two major characters- Tacenda and Davriel, the former a girl with magic, and the later a demonologist with his own secrets. I liked the manner in which Sanderson integrated the themes of paganism and Christianity into the story, with a light subversion to the mythology. The Prologu This novella is free in his website, and I have to say Sanderson is awesome. It is a quick one hour read with an amusing story with interesting characters. I enjoyed reading it. The story is told from the viewpoint of two major characters- Tacenda and Davriel, the former a girl with magic, and the later a demonologist with his own secrets. I liked the manner in which Sanderson integrated the themes of paganism and Christianity into the story, with a light subversion to the mythology. The Prologue sets up the entire mood of the novella, beginning with the siphoning of souls of an entire village leaving only one lone girl with her music. The magic and worldbuilding was interesting as usual. The setting of the novel is in a place called the Approaches, a little village situated at the far ends of civilisation near a dark and deep forest. The people worship the mysterious bog, which they believe protects them and has marked their souls. Tacenda lives in the village along with her parents and her sister. The two sisters are gifted with magic by the bog, and as as result Tacenda becomes blind by day, and her sister becomes blind by night. Tacenda's gift of magic is in her music, through which she sings warding songs to keep the dangerous spirits and beasts of the forest at bay. Her sister's gift is in handling the sword, and both protects the people in their own ways. It is a trademark of Sanderson that no matter how short a story he writes, he gives us interesting characters. The most interesting was Davriel, who is known as the lord of the manor by the people of the Approaches. He mostly keeps to himself along with his demon servants, and only asks the people for food and clothes as his services. He is in self exile from his own past enemies, and also his past which is equally mysterious. He acts like carelessly, has a sense of wry humor and wit, and also a keen mind. I liked the relationship between him and his demons, which was pretty delightful to read about. Tacenda is brave and unsure of herself, as she failed to protect the people, but she has a noble spirit, and it is he who persuades the uncaring Davriel to investigate the killings in the village. The antagonist was a surprising twist, along with some other aspects. However, I'm more interested in knowing what the 'Entity' lurking inside Davriel's mind is, and it would also be great, if Sanderson explores Davriel's past in later novellas. ‘What does she want?’ a feminine voice called from the other room. I relate to this character on a spiritual level. He and his relationship to his demons are the best part about this book. He made this story and was clearly the character that Sanderson really cared about. I kind of rushed through the ending because it was getting weird but it was a pretty cool story. Sorry, Brandon you didn’t get me into MTG but this was a cool story. YOU BETTER NOT DO ANY MORE SECRET PROJECTS OR SO HELP ME! So... uhm... do I have to read 60+ Magic books in order to read this one?